Those first few heart-pounding moments of any battle royale experience are arguably the most crucial. Finding a weapon is of course priority, but getting your hands on the best loot possible can change the dynamic of a match significantly. In Apex Legends, this rings true more than most with a vast selection of armor, consumables and attachments to trawl through. Interestingly though, in Apex you don’t always have to be the quickest off the mark (no Octane jokes please), with the map hiding away numerous cavities that even late on in the round can be found intact. In addition, there’s a number of influential decisions that can be made before even beginning the fight. 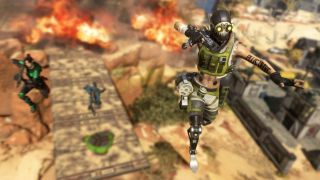 So what's the best way to become a loot master in Apex Legends? Well, read on to find out . Now that’s out of the way, let’s focus on two particular spots that we recommend best: Swamp and Water Treatment. One of the largest areas on the map and a nightmare to traverse because of the sludge, there’s an enormous amount of loot to be unearthed here. Banding out can help you cover extra terrain, yet increases the chances of encountering enemies alone. Tactically it’s best to land near the top zone and work your way south, giving you the marginally better high ground, while taking into account the enclosing circle. Also, as an extra perk the Supply Ship occasionally will land in the north-east region. What’s great about the Water Treatment is that it feels as close to a home base as there is in Kings Canyon. Featuring an abundance of supply bins to peruse, raised walkways and like the added bonus of the Supply Ship docking on either the east or west like the Swamp, all combining to make the area one hot property. It pays to be quiet sometimes. At any time when exploring buildings take a moment to listen for any small murmurings. Chances are this is an Apex Pack robot ready to gift you its top tier loot. All you have to do is melee the bot and take whatever goodies it leaves. No hard feelings little guy. We previously covered how to utilize every character in Apex, however it’s worth pointing out that Lifeline’s ultimate calls in a Care Package. Once landed this unit brings with it three high tier items for you and your clan to fight among one another for. Debatably one of the most overlooked features for loot hunting is the Hot Zone. When you begin the round, a blue circle will surround one region on the map. For this match only, you will see an increase in quality loot here as well as a higher rate of weapons that are fully kitted out with attachments. Just don’t expect to be able to walk in there without seeing some competition. Obvious but effective. The Supply Ship is naturally the go-to for players wanting to obtain some high-grade loot within the opening minutes. The vehicle is either stacked to high heaven with combatants or completely vacant for fear of confronting someone so early on. Regardless, there’s nowhere else on the map where you’re pretty much guaranteed to get loot valued at epic and above so quick. Just don’t dawdle.